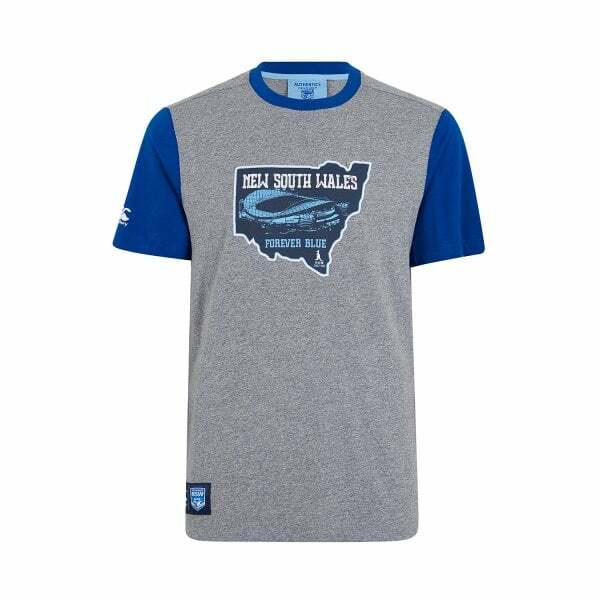 Featuring a map of NSW on the chest and Blues team and sponsor logos, this stylish tee makes great everyday casual wear plus a bold statement at Origin time about which side of the border you support. Show everyone where your allegiance lies in Canterbury’s Forever Blue State Map Tee. Part of our 2019 NSW Supporters range, this tee is stylish enough to wear on any smart casual occasion. It also leaves no doubt you’re a Blues supporter when the Origin build up begins. Made from a soft cotton and polyester mix and featuring a crew neck and contrast sleeves, it’s super comfortable whatever you’re doing, whether it’s watching the game or spending time with family and friends. Guaranteed to spend more time out of your wardrobe than in, better score a couple of these while they last.